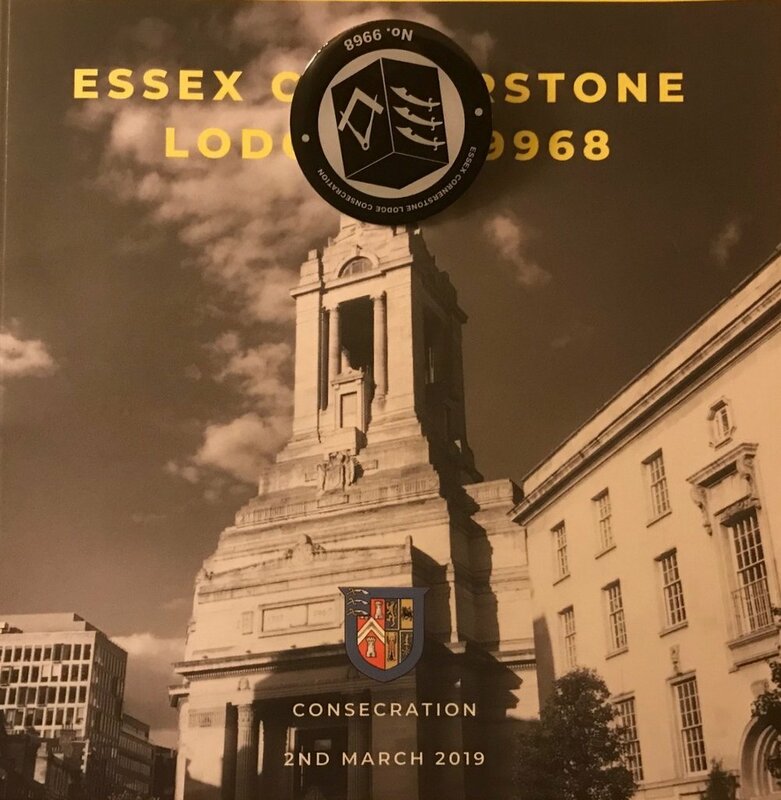 I ventured out representing the Five of Nine Club and quite possibly the Province Warwickshire on Saturday the 2nd of March when I visited Freemasons Hall in London for the consecration of the Essex Cornerstone Club’s new Lodge, which appropriately enough was called the Essex Cornerstone Lodge 9968. Although the lodge will be based in Essex, due to the over 600 masons attending and the significance of this being the first lodge to be consecrated for New and Young Masons, the consecration took place at Freemasons Hall. This is a spectacular venue and I strongly encourage you to visit it if you ever in London. Tours are free and open to the general public. Wives and partners can, of course, go around it too, there is even a gift shop. The grand temple is everything you would expect for the Headquarters of English Freemasonry. The ceremony was conducted by the Provincial Grand Master Rodney Lister Bass OBE and the Deputy Provincial Grand Master Paul George Reeves of Essex, and presided over by the Assistant Provincial Grand Master Sir David Hugh Wootton. The ceremony was conducted in a splendid manner and the hours of rehearsal by the consecrating team and founders were evident both from the start and throughout the ceremony. The coordination of the whole team was wonderful to watch and the timings of all movement were conducted without a word. To say any more would reveal far too much. Ordinarily, a consecration is only open to Master Masons and above, however cleverly the Cornerstone team had thought of this and provided a bespoke tour of the building for Entered Apprentices and Fellow Crafts. Without revealing anything of the ceremony of consecration itself, other than to say I have experienced being a founder and having previously taken part, it was a privilege to sit back, relax and reflect on the Lodge of Collegiate’s consecration and to be able to see the inner workings as well on this occasion. The new Worshipful Master was installed in a fine manner as you would expect from the Deputy Provincial Grand Master of Essex, and then the lodge was called off to allow formal photographs to take place, a much needed comfort break after nearly 3 hours of Masonic ceremony and it was also a chance for Entered Apprentices and Fellow Crafts to renter the lodge room for the Investiture of Officers. With the investiture completed the necessary formalities of a regular lodge meeting took place with notice being given to propose almost 30 joining members. We then retired to the Grand Connaught rooms where the Assistant Grand Master was received with much fanfare, quite literally. A lovely meal was then enjoyed, which included French Onion Soup and Beef Wellington. The Festive board continued until well into the night but regretfully due to trains to Warwickshire ending at 21:40 I had to miss that part. If any Five of Nine Members or Masons get the chance to visit a consecration I highly recommend you take it up, it is an incredible experience.